"Thor" (1901) by Johannes Gehrts. 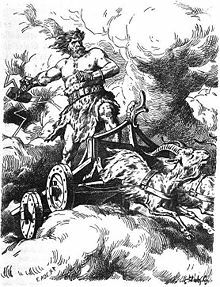 In Norse mythology, the megingjörð (meaning "power-belt" in Old Norse) is a belt worn by the god Thor. The Old Norse name megin means power or strength, and gjörð means belt. According to the Prose Edda, the belt is one of Thor's three main possessions, along with the hammer Mjölnir and the iron gloves Járngreipr. When worn, the belt is described as doubling Thor's already prodigious strength. In verse 7 of the skaldic poem Þórsdrápa (Thorsdrapa, Lay of Thor) written by the 10th-century poet Eilífr Goðrúnarson, in the service of Jarl Hákon Sigurðarson, refers to Thor's power-belt. The line "njótr njarðgjarðar" literally means "he who benefits from the mighty belt", referring to Thor's magical belt/girdle of strength/power, Megingjörð. In Gylfaginning, which is the first part of Snorri Sturluson's Prose Edda, after Prologue, verse 45 refers to Thor's power-belt. The line "Hann spennir sik megingjörðum, ok óx honum ásmegin" means "He girded himself with his belt of strength, and his divine strength grew" ("He" being Thor).